The location of these lines should have a direct impact on your tree and planting site selection. The ultimate mature height of a tree to be planted must be within the available overhead growing space. 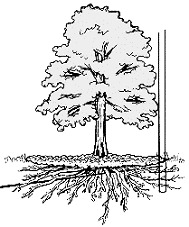 Just as important, the soil area must be large enough to accommodate the particular rooting habits and ultimate trunk diameter of the tree. Proper tree and site selection provide trouble-free beauty and pleasure for years to come. Overhead utility lines are the easiest to see and probably the ones we take most for granted. Although these lines look harmless enough, they can be extremely dangerous. Planting tall-growing trees under and near these lines eventually requires your utility to prune them to maintain safe clearance from the wires. This pruning may result in the tree having an unnatural appearance. Periodic pruning can also lead to a shortened life span for the tree. Trees that must be pruned away from power lines are under greater stress and are more susceptible to insects and disease. Small, immature trees planted today can become problem trees in the future. 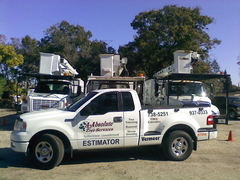 Tall-growing trees near overhead lines can cause service interruptions when trees contact wires. Children or adults climbing in these trees can be severely injured or even killed if they come in contact with the wires. 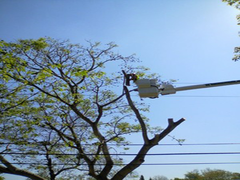 Proper selection and placement of trees in and around overhead utilities can eliminate potential public safety hazards, reduce expenses for utilities and their rate payers, and improve the appearance of landscapes. Trees are much more than just what you see overhead. Many times, the root area is larger than the branch spread above ground. Much of the utility service provided today runs below ground. Tree roots and underground lines often coexist without problems. However, trees planted near underground lines could have their roots damaged if the lines need to be dug up for repairs. The biggest danger to underground lines occurs during planting. Before you plant, make sure that you are aware of the location of any underground utilities. To be certain that you do not accidentally dig into any lines and risk serious injury or a costly service interruption, call your utility company or utility protection service first. Never assume that these utility lines are buried deeper than you plan to dig. In some cases, utility lines are very close to the surface. 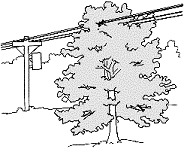 The illustration indicates approximately where trees should be planted in relation to utility lines. 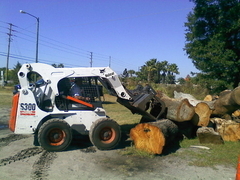 Your garden center staff or tree care professional will gladly help you select the right tree. Trees that grow as tall as 60 feet (20 meters) can be used in the area marked as the tall zone; however, you should consider your neighbor’s view or their existing plantings of flower beds and/or trees. Plant large trees at least 35 feet (11 meters) away from the house for proper root development and to minimize damage to the house or building. These large-growing trees are also recommended for streets without overhead restrictions. Street planting sites must also have wide planting areas or medians [greater than 8 feet (3 meters)] that allow for a large root system, trunk diameter, and root flare. Large trees are also recommended for parks, meadows, or other open areas where their large size, both above and below ground, will not be restricted, cause damage, or become a liability. Trees that grow up to 40 feet (12 meters) tall can be used to decorate or frame your house or provide a parklike setting. Select your trees first, then plant shrubs to complement the trees. Medium-sized trees are also recommended for planting anywhere the available above and below ground growing space will allow them to reach a mature height of 30 to 40 feet (10 to 12 meters). Appropriate soil spaces are wide planting areas or medians [4 to 8 feet (1 to 3 meters) wide], large planting squares [8 feet (3 meters) square or greater], and other open areas of similar size or larger. This zone extends 15 feet (4.5 meters) on either side of the wires. Trees with a mature height of less than 20 feet (6 meters) may be planted anywhere within this zone, including street tree plantings under utility lines. Such trees are also recommended when the growing space is limited. These trees are appropriate as well for narrow planting areas [less than 4 feet (1 meter) wide]; planting squares or circles surrounded by concrete; large, raised planting containers; or other locations where underground space for roots will not support tall- or medium-zone trees. Plant evergreen trees to serve as windbreaks on the west or north side of the house, approximately 50 feet (15 meters) or more from the house. Plant deciduous trees (those that drop their leaves in the fall) on the south and/or west side of the house to cool in the summer and allow sun to enter the house in the winter. Planning before planting can help ensure that the right tree is planted in the right place. 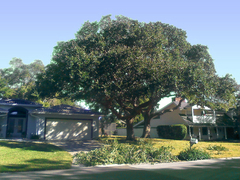 Proper tree selection and placement enhance your property value and prevent costly maintenance trimming and damage to your home. For further information on planting and helpful tips on tree selection, refer to ISA’s brochures on tree selection and new tree planting. If you have any more questions, please contact your local ISA Certified Arborist or tree care professional, utility company, local nursery, or county extension office.